30 septembre 2014 — This light pink strawberry mousse dessert that has the taste of summer’s sunshine has aThis light pink strawberry mousse dessert that has the taste of summer’s sunshine has a fluffy light flavor of strawberries combined with whipped cream and some cream cheese. What better and sweet treat to have while enjoying the sun’s rays and the warm winds brushing your skin while sitting in your garden surrounded by flowers! 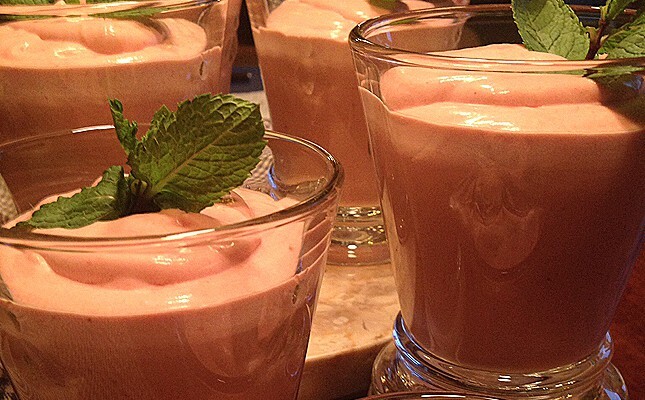 Strawberries contain lots of juice, which can ruin the texture of a mousse that needs to be rich and creamy. There are tricks you can use in order to master the perfect mousse desert when it contains berries. By macerating small pieces of the strawberries, combined with sugar and a pinch of salt, it will release the liquid, which you will work from in order to obtain the proper consistency. Given the strawberries unique combination of antioxidant and anti-inflammatory nutrients, it’s not surprising to see strong research support for strawberry health benefits in three major areas: (1) cardiovascular support and prevention of cardiovascular diseases (2) improved regulation of blood sugar, with decreased risk of type 2 diabetes, and (3) prevention of certain cancer types including breast, cervical, colon, and esophageal cancer. In this strawberry mousse recipe, we will use unflavored gelatin in order to give the strawberry mousse some texture and add some cream cheese for a richer and creamier body.